Stay tuned for all the latest developments, election results and reactions as Albania goes to the polls to elect a new government. The Socialist Party, run by the Prime Minister, Edi Rama, is asking voters for a second mandate to govern the country. The second pretender to victory, hoping to become Prime Minister himself, is the leader of opposition Democratic Party, Lulzim Basha. The election result of the Socialist Movement for Integration, LSI, a party that has played the role of kingmaker in the elections in 2009 and 2013, is also awaited with interest. Albania has had a regional proportional system since 2009, in which parties compete to win the biggest number of seats in 12 electoral zones. A total of 140 MPs will be elected to parliament for the next four years. The Tirana zone has the highest number of mandates, with 34, while Fier comes in second place with 16. Durres and Elbasan each have 14. 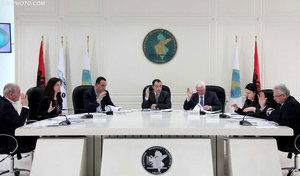 The northern area of Kukes, a smaller electoral zone, will elect only three. President-elect Ilir Meta was the first politician to vote, accompanied by his wife, MP Monika Kryemadhi and their daughter who voted for the first time. Meta, the former chairman of the Socialist Movement for Integration, LSI, led the electoral campaign for his party. Its role as “kingmaker” has been visibly shaken by the attacks that the two main parties have directed towards LSI. The leader of the opposition, Lulzim Basha, voted in Tirana accompanied by his wife, parents and brother. He said that he considers the day very important for the future of Albanians. The international community is very active in Albania on voting day. 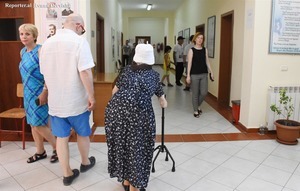 The EU delegation in Tirana has sent representatives to polling stations throughout the country and US Ambassador Donald Lu is visiting polling stations in the coastal city of Durres. In terms of international observers, the OSCE/ODIHR mission comprises some 330 observers from 43 countries, including 255 long-term and short-term staff. The Central Electoral Commission, CEC, has announced that as of 1:00pm the turnout in the election stood at 26.76 per cent. Data show that 923,824 Albanians have already voted, while 3,452,260 are eligible. The turnout is reportedly higher in the northern electoral area of Kukes with 32.64 per cent, followed by Diber with 31.31 per cent and Tirana with 30.42 per cent. The Socialist Movement for Integration, LSI, stated that one of its members in the coastal northwestern town of Shengjin, has been shot. 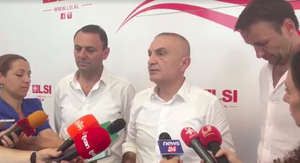 Former party leader Ilir Meta travelled to the region accusing police there of being biased and “defending criminals instead of citizens” after no arrests were made. Police initially reported that shootings occurred in a restaurant in the port area. They said that at the site of the shooting a shell casing was found, and that no one seeking treatment for a gunshot had sought help in area hospitals. The Socialist Party, PS, in Lezhe (the region in which Shengjin is located) stated in a press release that it considered Meta’s statements “a reflection of a political desperation and loss of logic,” emphasising that Meta is already president-elect and such political maneuvers are disrespectful of the position. CEC has announced that as of 4:00pm voter turnout stood at 34.72 per cent. Data show that 1,198,624 Albanians have already voted, while 3,452,260 are eligible. The turnout is reportedly higher in the northern electoral area of Diber with 53.74 per cent followed by Tirana with 38.95 per cent. Polls have officially closed in Albania after having been open for 12 hours , from 7:00am, without interruptions. However, according to the electoral code, polling stations should stay open if there are still people waiting in line to vote. CEC declared a preliminary electoral turnout a few minutes after polling stations closed nationwide. According to CEC, the turnout they calculated based on data collected from the polling commission was 43.88 per cent. The turnout is one of the lowest ever reported for a general election in Albania, although it is still possible it will increase after CEC processes all the data. In 2013, the general election turnout was 52.7 per cent and around 1,750,000 people voted. Today, according to preliminary calculations, 1,514,851 people voted out of a possible 3,452,260.